Bettering the guest experience is at the top of every hotel owner’s list. 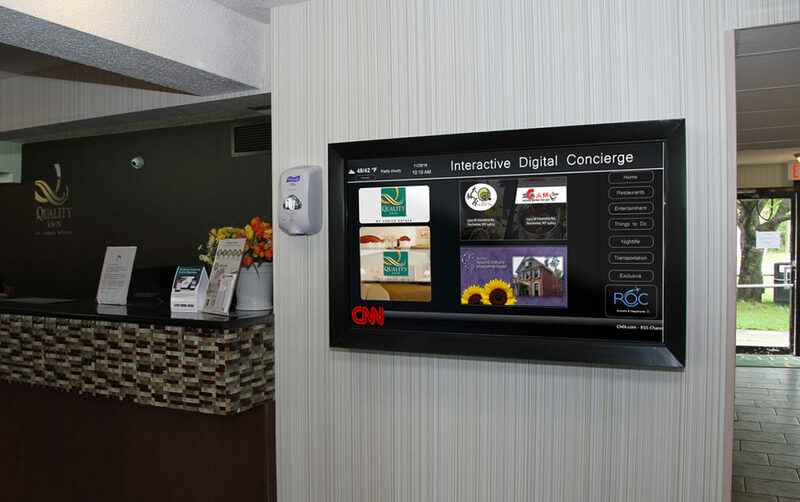 With the ever-changing needs of hotel guests, standard and interactive digital signage allows hotels to be as flexible and accommodating as possible. Content can be modified with the click of a button, allowing you to provide guests with exactly the information they need at exactly the right time. Incorporate all of your room booking needs into one compact and sleek touch-screen device. Digital room signs allow you to manage conference room booking at your hotel simply and conveniently using an already existing schedule. Guests can check room availability and book a room right at the sign. Our cloud-based software allows you to feed in live information directly from an already existing scheduling app such as Office 365, Crestron, Delphi or AMX. Click here for more information on digital room signs. Click here to request a quote for your hotel. Reader boards allow you to present event and meeting information to your guests as soon as they enter the lobby. 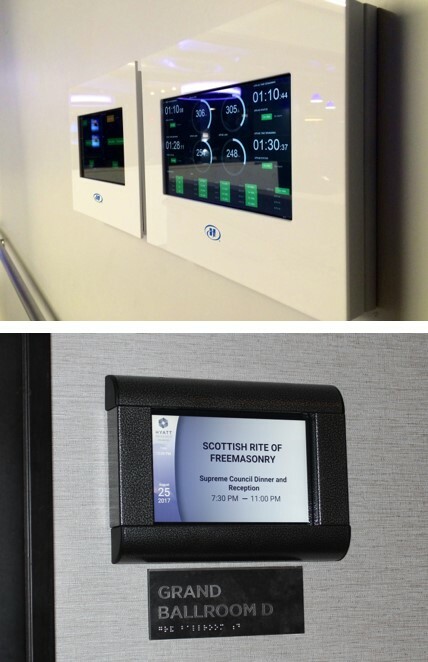 Whether they are looking for a specific room or meeting, or your staff is using it as a tool to become more aware of what’s going on inside the hotel, a system like this is the perfect addition, especially if you have or are looking into purchasing room boards. Like room boards, we can link directly into your existing schedule or room reservation software, so that events are always up to date and accurate. Another option is to incorporate touchscreen features – including wayfinding, event room booking, local attractions, etc. See more information on interactive systems below! Interactive solutions are the ultimate in guest service. Think of an interactive kiosk as another employee that can provide guests with information about the facility, restaurant and the surrounding area. Interactivity empowers guests to create the visitor experience that most satisfies them– ensuring they will want to return to your hotel. 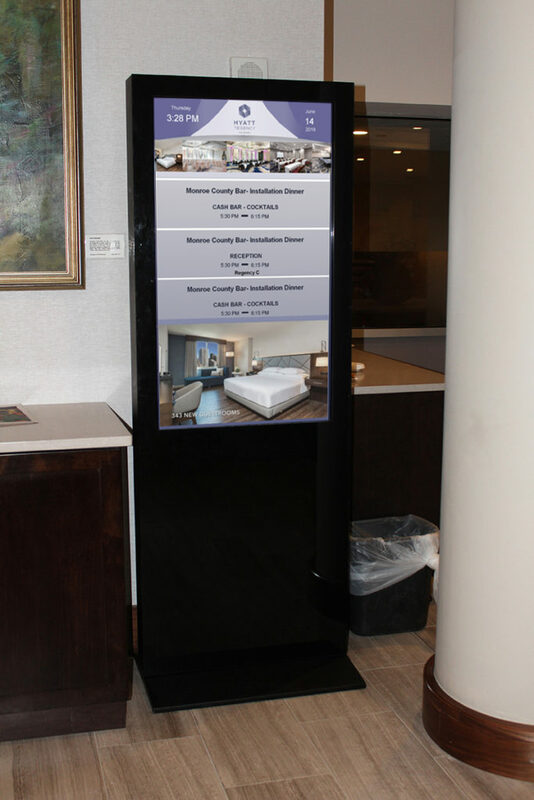 As with all of our products, your hotel’s interactive display or kiosk can be custom-designed from the user interface to the enclosure. Content can be remotely updated and redesigned as you see fit. Empire Digital Signs will provide software training and can even manage your content for you. Click here for even more information on interactive solutions. 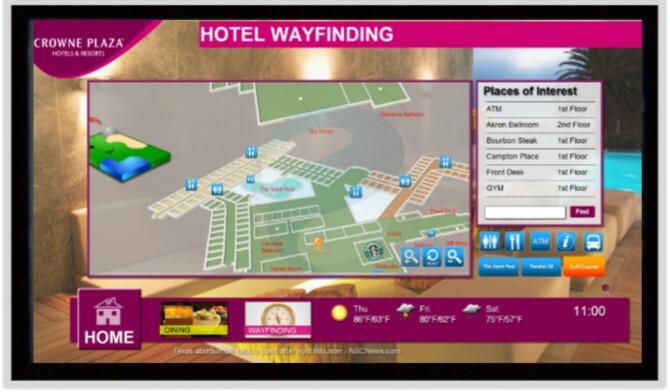 Allow your guests to navigate your hotel in a high-tech fashion. Digital wayfinders are becoming a staple in most large facilities – specifically in the hospitality industry. Empire Digital Signs’ 3D wayfinders offer turn-by-turn directions, dynamic pop-ups and even text-to-mobile directions. If you’re already looking to add an interactive kiosk to your facility, talk to us about adding digital wayfinding to your kiosk!